My husband and girls love crackers. 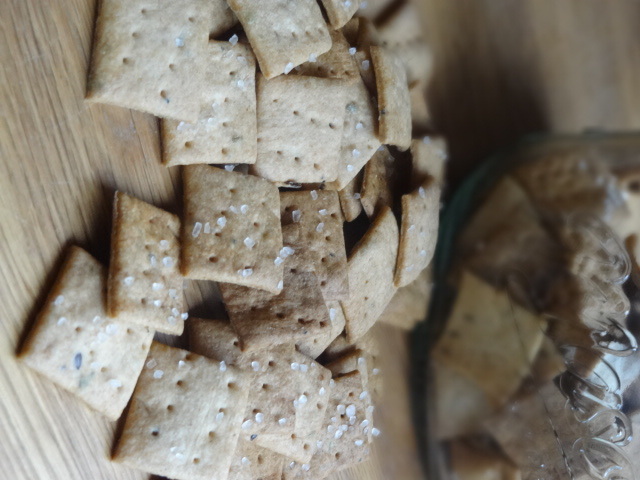 I love making them homemade crackers since they are so much healthier! I don’t make them every week but when I do they just love them! 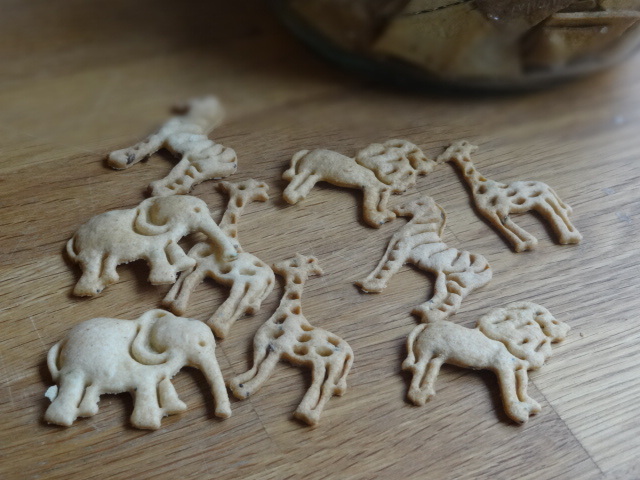 Animal crackers are definitely cuter but simple squares are so quick and easy. These are surprisingly quick and easy to make, especially if you have a sourdough starter and are always looking for fun things to make with it. You can make your own, I purchased mine from King Arthur Flour and have been really happy with it. If you don’t want to dabble with sourdough you can find my wheat thin recipe here. I buy all of my spices from Savory Spice Shop now, they are always great quality and if you think buying spices from spice shop is more expensive than a grocery store you might be surprised! I love serving crackers and cheese ball for holidays, maybe because that’s what my mom always did! Mix together all ingredients until well combined to make a smooth dough. Divide dough dough in half and wrap in plastic wrap and refrigerate for at least 30 minutes. Spray a silicone mat or parchment paper with nonstick spray and roll out dough as thin as possible, try for around 1/16 inch. Trip edges and cut into 1 1/4 inch squares with a pizza wheel cutter or knife. (or cut into shapes). Sprinkle with additional sea salt if desired. Bake at 350 degrees for 20 to 25 minutes. Repeat with second half of dough. Store in an airtight container for a week, or freeze for longer storage. This isn’t a RECIPE recipe… if you know what I mean. But let’s face it, the best recipes are the ones you use constantly and make your life better. Right? Well this is something I make more often than not for breakfast and my youngest actually requests it for breakfast. I try to make a few times a week but this totally saves my day. I made it a goal a couple years ago to slow down and stop skipping breakfast before my girls started copying me. And this recipe has kept me on track. 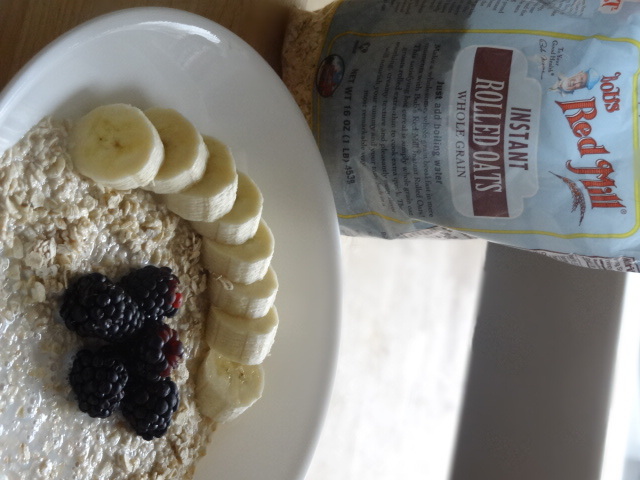 I use instant or quick oats because they are still whole grain but will soften up in cold milk. My youngest actually likes old fashioned rolled oats, they will soften a little but have more chewiness. My go to is banana and berries but my girls like a little peanut butter powder and honey. For special days I add some sprinkles and mini chocolate chips for them. (Hey, oatmeal can be cool too!) Now go forth, and conquer the morning rush! 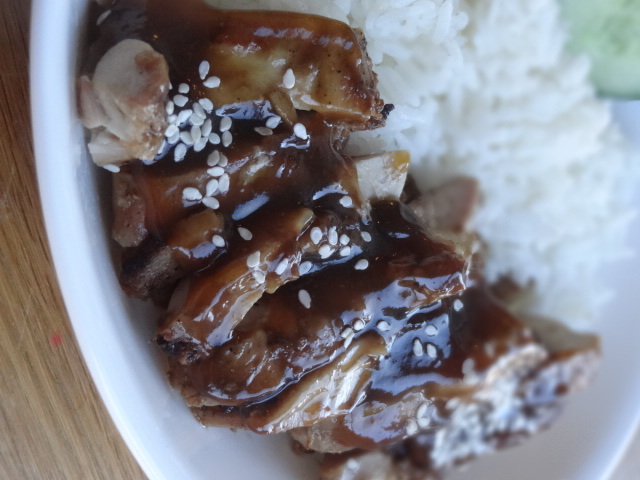 I have a soft spot for teriyaki. While pregnant with both my daughters it was the thing I craved. Especially from our favorite teriyaki restaurant piled high with a mound of sauteed cabbage, carrots, and broccoli. Weirdly, we didn’t have teriyaki once while pregnant with my youngest. If I had just made this recipe back then we would have had it every week I think! Better late than never though, right?! I used boneless skinless chicken thighs but you could use chicken breasts as well. Just watch you don’t overcook them on the grill. No grill? No problem, just use a grill pan or heavy skillet indoors. I usually make extra of the sauce and keep some in the freezer too for a quick dinner. Place everything in a ziplock bag and seal, removing as much air as possible. Massage marinade into chicken making sure all surfaces are covered. Chill for at least an hour, up to 4 hours. Remove chicken from marinade and grill over medium high heat until cooked through. Serve with teriyaki sauce, stir fried vegetables, and rice. In a small saucepan whisk together the brown sugar, soy sauce, ginger, garlic, and 1 cup of the water. In a small bowl, whisk together the remaining 1 cup of water with the cornstarch. If you’ve never had Chinese five spice it isn’t a hot heat, more of a numbing heat from the szechuan peppercorns. Totally addictive and just my kind of heat. While we may not be football fans if it’s a reason to make these delicious bites I’m in! You can buy 5 spice all ready made but I added my recipe to make your own. If you want some extra spice you can double the 5 spice used in the recipe. And because these are double fried they are super crunchy and you can even do the first fry a day ahead and just do a quick fry before serving. Heat 2 inches of oil in a deep pot and heat over medium high heat to 350 degrees. Line a baking sheet with paper towels and place a wire rack upside down on top of the paper towels. Set aside. Whisk together the flour, cornstarch, 5 spice, salt, and water in a medium bowl until smooth. Work in batches to fry the chicken (don’t overcrowd your pot or the oil temperature drops too much) until chicken is cooked through to 165 degrees. 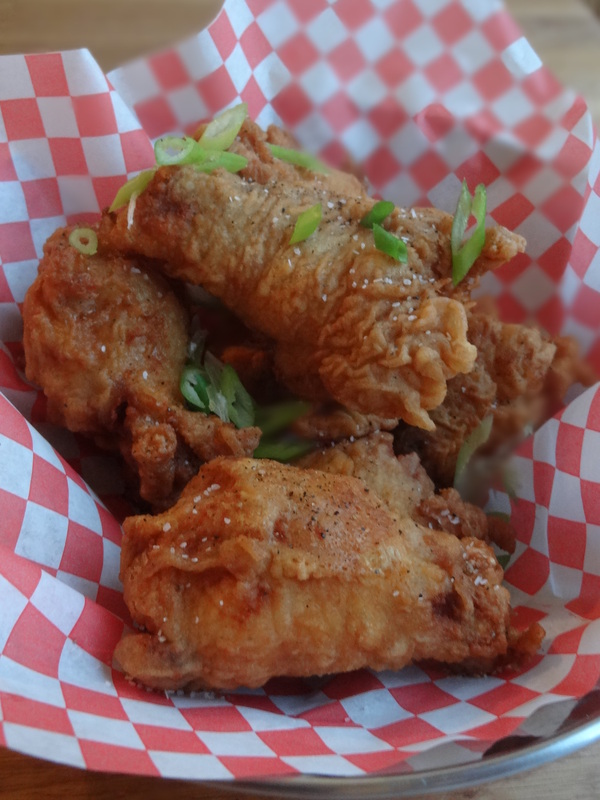 Drain chicken and sprinkle with additional salt, pepper, and green onions while hot. Combine all in a spice blender. Store in an airtight glass jar. Work in batches to fry the chicken (don't overcrowd your pot or the oil temperature drops too much) until chicken is cooked through to 165 degrees. So I’m thinking this Sunday instead of missing out on the celebration we’ll have a “Salsa bowl Sunday”! Because that’s really the one bowl my husband can’t live without! 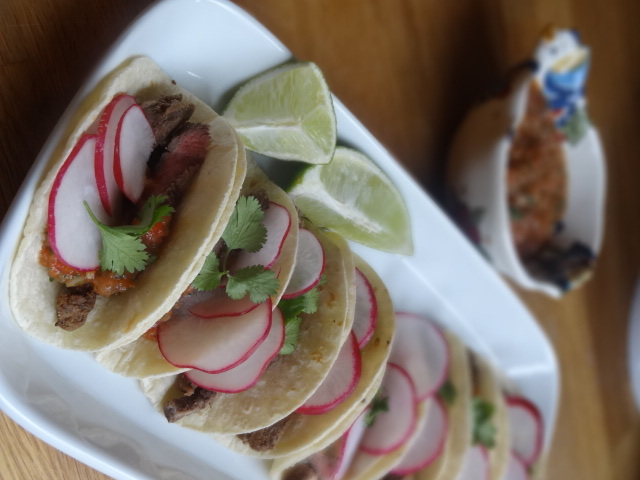 The other day I panicked when the store was completely out of skirt steak, which is what I usually use for my favorite carna asada tacos. Now I try to be flexible, but I just really felt like steak tacos. So I adjusted slightly since I did have some round tip and made a spiced beef taco instead. And they are our new favorites! (Well.. it’s tacos. So you can’t really have ONE favorite!) Round tip is very lean so marinating with a little acid really helps tenderizing and cutting the meat thinly as well. I found them very tender and flavorful. Mix spices together and add to a ziplock bag with the steak, olive oil, and lime juice. Seal bag and massage into the meat, making sure all sides are coated well. Let marinate in the refrigerator for at least 2 hours. When ready to cook heat a cast iron pan over medium high heat and cook in batches for a few minutes on each side, depending on how large your steaks are and your desired doneness. Let rest for at least 10 minutes before slices thinly or chopping. 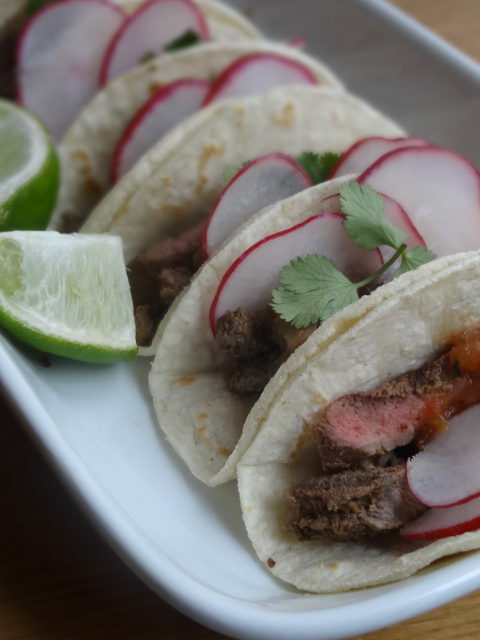 Serve in heated tortillas with salsa, radishes, cilantro, and lime wedges on the side. *If you like spicier tacos, use chipotle powder here (more if you like). 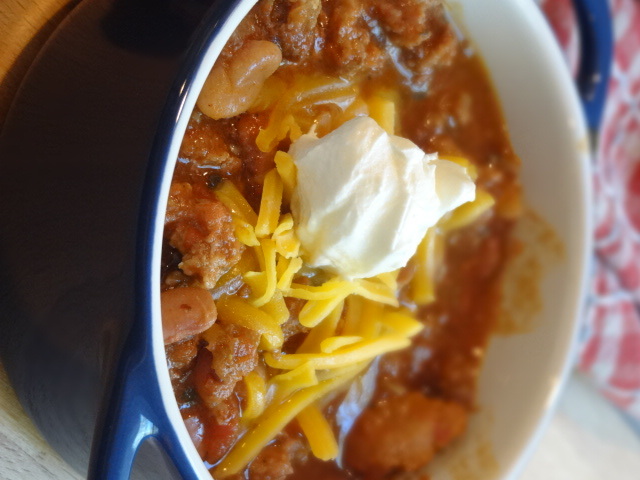 Ancho has a great chili flavor without being hot and even our kids love it. Potstickers. Gyoza. You might as well call them what they really are.. delicious and addictive! Once you’ve had homemade you won’t be able to eat the frozen ones anymore! They are much easier than you think. They can be really fun for kids to help make too. You can make them with ground pork, turkey, or chicken as well. Just make sure you use a leaner meat. And green cabbage would work well too. But my girls loved the purpley color of the filling! 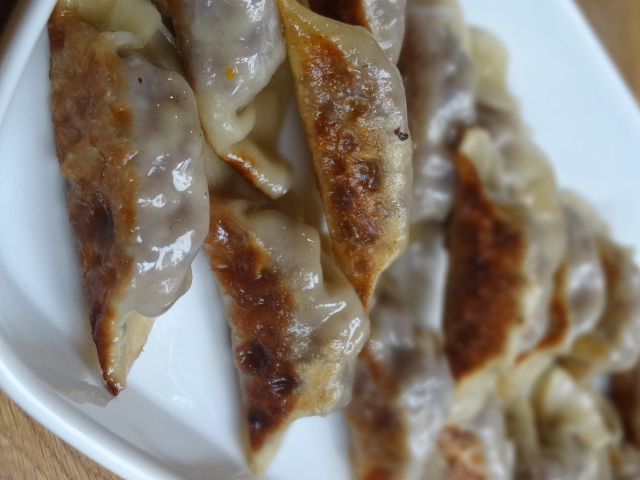 If you want some more step by step pictures you can look at my Pork potsticker recipe here. In a large mixing bowl mix everything together until well combined. Place a tablespoon of filling in the center of a wrapper. Dip your fingers in water and wet the edges of wrapper. Press together close to the filling, pleating one side if desired. Repeat with remaining wrappers and filling. Place on a cookie sheet covered with a damp paper towel as you work. Heat 1 T oil in a large skillet over medium high heat. (You just want to barely coat the bottom of the pan, no pooling or excessive oil). Lay flat side of potstickers down, in a single layer in skillet. Cook for 2 minutes uncovered. Pour 1/3 cup water into skillet, cover, and turn heat to medium. Cook for 3 minutes. Uncover, and let all the liquid cook off, then repeat with remaining potstickers. My favorite recipes are always the simplest. This is one of those dishes. I tend not to like vegetable dishes that try to make them into something else. Roasting and vegetables are a match made in heaven and cabbage is no exception. While I usually serve it as a side dish I would be happy with this for a main dish I love it so much! I usually serve it with Spaetzle or rye pasta. (I’m still perfecting that rye pasta recipe!) If you dislike caraway by all means leave it off. Heat oven to 425 degrees. Spray a large baking sheet with nonstick spray. 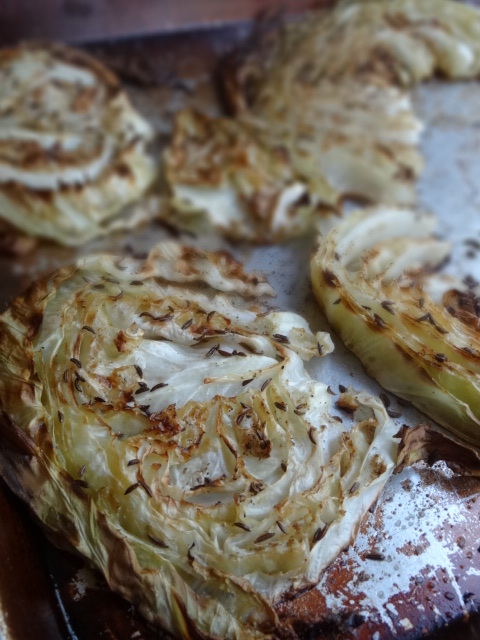 Arrange cabbage steaks on baking sheet leaving at least 1 inch space between each one. Drizzle with olive oil (approximately 1/2 teaspoon per cabbage steak). Sprinkle with salt and pepper and caraway and celery seeds. (just a pinch of each per steak). *To slice cabbage I like to cut in half (from top of head to core) and cut the core out of each half. Slice going from top of head to bottom, saving the round ends for another use if desired. To slice cabbage I like to cut in half (from top of head to core) and cut the core out of each half. Slice going from top of head to bottom, saving the round ends for another use if desired. Through the year in talking with close friends I found that pretty much all of my friends have yet to have a mammogram. I am almost 40 and many of my friends are in their mid to late 40s. I found this totally shocking. I think of all the things I see women around me doing for their health, going to much expense of time and money. Expensive probiotics, marathons, eating well, vitamins, I’m sure you can think of many more too. And yet so many women choose not to get a mammogram. Cancer could care less how fast you ran your last marathon. Or the status of your gut health. This simple fast and easy test can save your life. And can save you from needing more extensive treatments by catching cancer early. Many doctors are now recommending women wait until they are 50 before starting annual mammograms. Why? Because insurance companies research shows not enough women are saved. I’m not even going to say anything else about that. Mammograms show cancer up to 2 years before patients and doctors would detect it. Mammography has helped reduce breast cancer mortality rate in the US by nearly 40% since 1990.
of women diagnosed with breast cancer have no family history of the disease and are not considered high risk. Even for women aged over 50, skipping a mammogram every other year would miss up to 30% of cancers. I promise to get back to sharing my favorite recipes soon. In the meantime, schedule your mammogram! Winter is here! While I love slow cooked food, especially in the winter, sometimes I break out my instant pot to make things happen fast! 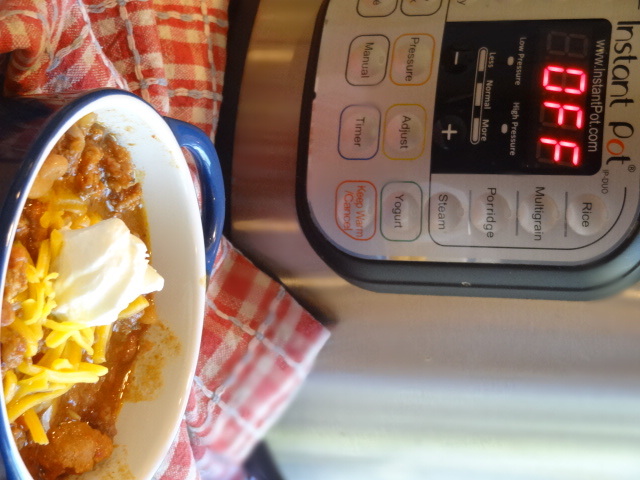 Chili is a perfect use for the instant pot if you don’t have hours and hours to simmer it. You can even use uncooked, unsoaked beans! 1. Never add salt to uncooked beans as it inhibits them from fully softening. Season after they are cooked. 2. If you want more flavor than spice, try ancho chili powder. It adds a deeper flavor without all the heat. If you want more spice, increase the chipotle powder. Chili is really only as good as the spices you use. While I used to buy mine only from Penzey’s spices I have converted to Savory Spice Shop. If you have a local storefront I highly recommend going, it is a feast for the senses! They still store in glass jars which is better for retaining spices flavor and quality. I don’t get into the city often though so I use their website a lot. 3. You can use any ground meat. Half beef and pork is my favorite and has great flavor but turkey or chicken would work as well. Dump everything in instant pot. Cook on high pressure for 40 minutes, natural pressure release for 15 minutes. Break up meat and stir well to combine. Serving ideas: Shredded cheddar cheese, corn chips, sliced green onions, sour cream, lime wedges, cilantro, Serve with baked potatoes or cornbread for bigger appetites. 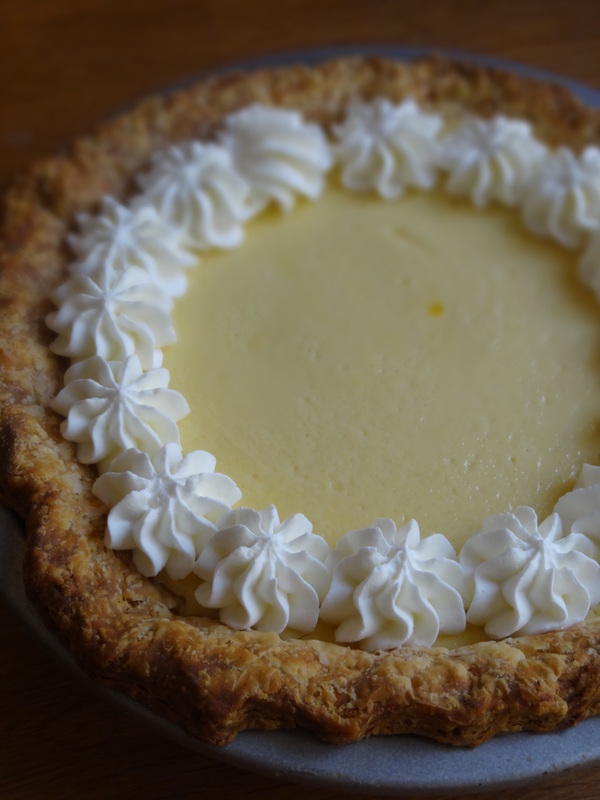 This is my go-to pie recipe. After a big Thanksgiving dinner I love a citrus dessert. Plus, it’s easy and my absolute favorite! My family always requests it when I’m making the holiday menu. I always use my homemade piecrust, but whatever works for you is fine. You can find my recipe here, along with easy directions. I usually make this a day or 2 ahead with no issues. And since we’re in the Thanksgiving week a little reminder to make a cooking schedule! It takes so much of the stress out of holiday cooking. Sprinkle the gelatin over the water. Let soften for 5 minutes. Microwave for 14 seconds. Mix together the egg yolks and sweetened condensed milk in a medium bowl. Beat on high for 2-3 minutes. Add in the gelatin, heavy cream, and salt. Mix until thoroughly combined. Add in the lemon juice and beat on low for 30 seconds. Pour into prebaked crust and at 375 degrees for 22-25 minutes. Cool and serve at room temperature or chilled with whipped cream. *To blind bake (prebake) a piecrust place piecrust in freezer for 10 min (Or even a few days ahead! Use a metal pan though! ), line with parchment paper and pie weights or black beans. Bake at 375 degrees for 30-45 minutes (depending how thick your crust is) until light golden. Proceed with filling recipe. To blind bake (prebake) a piecrust place piecrust in freezer for 10 min (Or even a few days ahead! Use a metal pan though! ), line with parchment paper and pie weights or black beans. Bake at 375 degrees for 30-45 minutes (depending how thick your crust is) until light golden. Proceed with filling recipe.